After logging in to the Medical Residency Scheduling Tool you arrive at the Home Page (shown below). 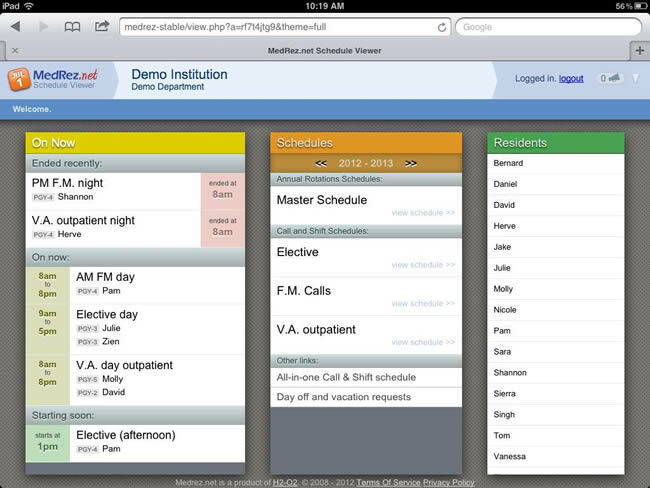 From this simple screen you can choose to work on any of the Schedules you previously created, or create a new one. Click image to view full size. Click image again to shrink. Clicking the "Edit" button in the screen above takes you to the Rotations Schedule's main page (see below). Clicking an "Edit" button for a Call/Shift schedule in the home screen takes you to the Schedule's main page (see below). This is where you manage all the Blocks of the Schedule. In addition to renaming and changing the dates of a Block you can put it in the Trash to remove it completely from the Schedule. You can "Un-Trash" a Schedule at any time. The Residents page is where you manage all residents for the Schedule and where you add residents to the Blocks. To do so simply click inside the grid, or use the "Sync with Annual Rotations Schedule" function to automatically include residents based on their rotation. The Schedule Page is composed of a list of residents on the left and a calendar on the right. There is also a Good-Bad window that informs you of the pros and cons of adding (or removing) a resident to a shift or call. Shifts and calls are shaded in green to indicate that there is no reason why the selected resident couldn't work there. Red shading indicates a scheduling error, such as putting a resident on when they requested to be off, or an ACGME duty hour rule violation. In the Schedule Page you can expand the list of residents to show statistics for your residents. The table shows the number of calls and shifts the resident is taking in this schedule. You can set target numbers for any of the columns by clicking the "Edit" button. The green numbers turn red when they are outside the target values. Duty hour statistics are also shown, including calls per week, days off per week, and number of duty hours per week. 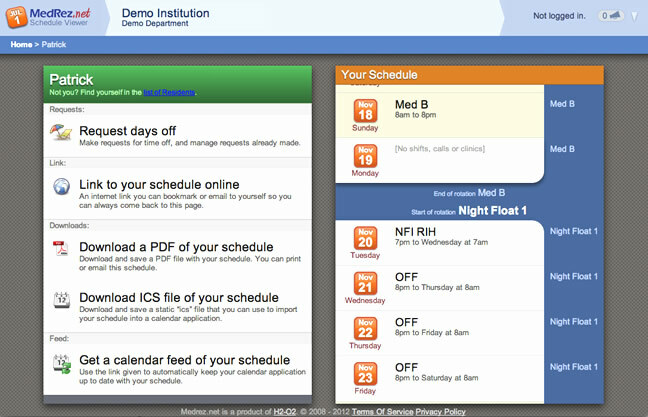 Residents, Attendings and Fellows view their schedules online on MedRez.net. 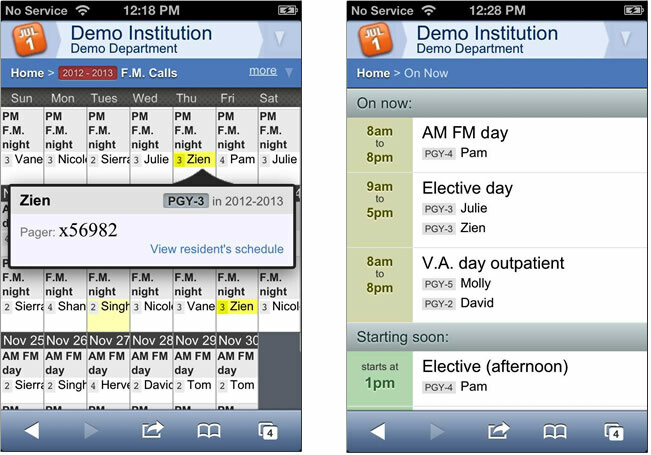 Staff members who have iPhones™, Android or other modern internet-enabled mobile devices can take advantage of the special pages for these devices built into the MedRez.net Schedule Viewer.